Barry University is a private, Catholic University founded in 1940 located in Miami Shores, Florida and is one of the largest Catholic universities in the Southeast. The University offers more than 100 degree programs, from bachelors to doctorate, in a number of areas, including: business, social work, law, nursing, health sciences, education, and liberal arts programs. Consisting of six schools and two colleges, Barry University has more than 7,000 students, a campus of 54 buildings, a branch campus in Tallahassee, a law school in Orlando, and 50,000 alumni. Regina Lopez, Director of Database Services and Tracy Graham, Associate CIO University Business Solutions at Barry University have been using Entrinsik Informer for 10 years. They have over 4500 reports in production, pulling data from their Colleague® by Ellucian database. They are also using Business Objects to run more complex Registrar, Admissions and Financial reports. With staff cuts and budget constraints they no longer had the in-house Business Objects expertise needed to create and maintain those reports. In addition, with the implementation of Workday, the Admissions data was no longer maintained in Colleague but instead captured in Salesforce.com. They needed to aggregate data from these different sources to create reports and dashboards for users across departments. The team at Barry needed to determine whether to upgrade their Business Objects instance or migrate to an alternative solution like SQL Reporting Solutions to meet their more complex reporting needs. After seeing a demonstration of the new Informer 5 at an Ellucian user conference, they decided to investigate whether the new version could meet their needs instead. After installing Informer 5 and participating in an onsite training session with Tim Nicholson, VP of Customer Services and Support, the Barry team worked with Tim to recreate several complex Business Object reports. Those reports within Business Objects required a significant amount of manual intervention to pull student data from Colleague, and applicant tracking data from Salesforce CRM. With Informer 5, Barry was able to easily stream data into Informer from Colleague using the native database connectivity. 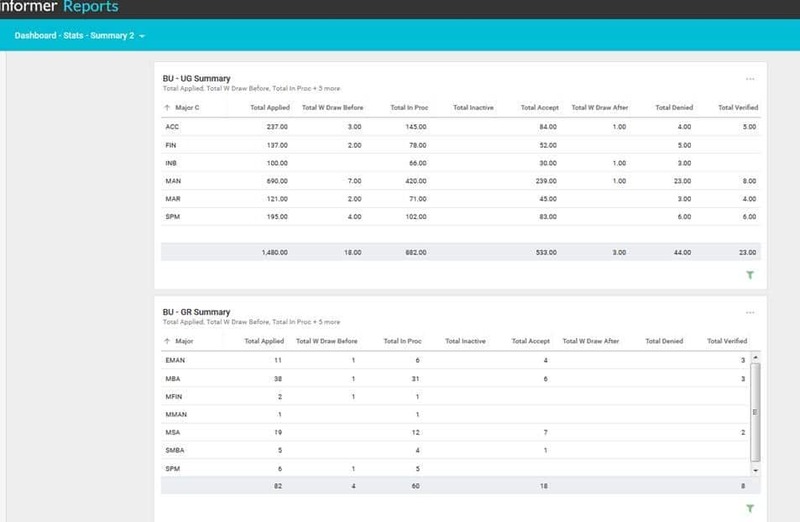 The Salesforce data was imported into Informer using the Workspaces feature. The two resulting Datasources were connected using a simple Informer Flow Step. PowerScript Flow Steps were applied to do things like validate and summarize the data. From there, curated Informer Datasets were created reflecting one version of the truth for Admissions data, Invoice data, Financial Aid data, and more. Reports that relied on Barry’s ODS database could now be pulled directly from the live Colleague data to ensure accuracy. 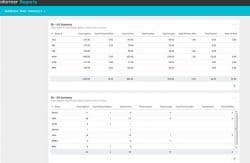 The resulting data was then presented in Informer Dashboards for users to consume. Using Informer 5, the team at Barry can extract data from Salesforce via spreadsheets to easily import into Informer Workspaces, blend with data already in Colleague Datasets, and push the aggregated data out to users via Informer Dashboards, saving three days of manual work. “As a result of using Informer 5, Barry will save thousands of dollars by moving many of our analytical reports from Business Objects to Informer,” says Regina Lopez. The staff at Barry can now easily visualize and analyze data based on one version of the truth, freeing up valuable IT resources by empowering users to explore relevant data on their own.